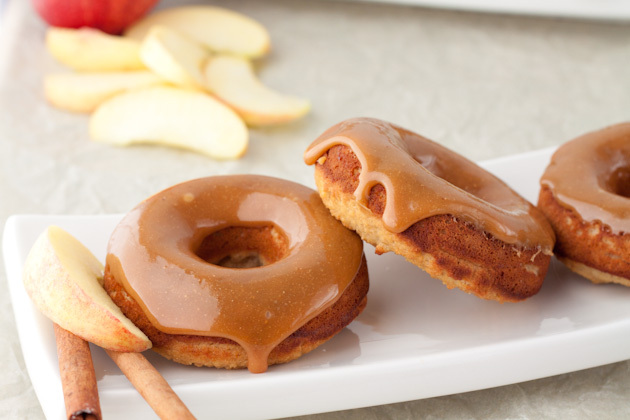 Caramel apple flavors in doughnut form. zomg. Add dry to wet and stir to combine. Allow to sit for 2-3 minutes to thicken up. Fill each cavity 3/4 to the top. Be careful not to overfill or the doughnuts will overflow while cooking. Place in the oven to bake for 20-22 minutes, or until toothpick inserted comes out clean and edges are just beginning to brown. Remove from oven and allow to cool for 1-2 minutes before grabbing the pan with an oven mitt and tipping over onto a cooling rack. 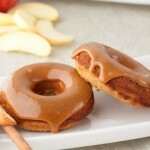 Allow to cool completely (about 30 minutes) before preparing the caramel topping. To prepare the topping: place honey in a small frying pan and heat on medium-low heat for 4 minutes, stirring constantly with a fork or spoon. The honey will begin to foam. Don’t worry, this is good!